Apple pushed out iOS 11.4 on May 29 to iPads and iPhones, which included the long-awaited Messages in iCloud feature. The company did not release macOS High Sierra 10.13.5 at the same time, limiting the usefulness of being able to sync messages in the cloud since 10.13.4 is not compatible with Messages in iCloud. But three days later, Apple finally released macOS 10.13.5. Apple isn't very consistent when releasing new macOS versions that coordinate with new iOS ones. Sometimes the Mac updates come at the same time, sometimes it's a few hours later, sometimes it's days later. For some examples, iOS 11.0 was released six days before macOS 10.13, the iOS 11.1 and macOS 10.13.1 updates were released at the same time, and macOS 10.13.4 came out about six hours after iOS 11.3. The biggest feature that users have been waiting for since September 2017, aside from AirPlay 2, is Messages in iCloud, which stores all texts and iMessages in iCloud and syncs between iPads, iPhones, iPod touches, and Macs. So it seems odd that Apple waited so long to release macOS High Sierra 10.13.5 when users wouldn't be able to utilize Messages in iCloud to its fullest without its Mac counterpart. Oddly enough, Apple did push out an update for iTunes 12.7.5 shortly after iOS 11.4, which includes minor app and performance improvements. To make this point clearer, if you only have one iOS device and a Mac or two, Messages in iCloud wouldn't help you sync conversations across your devices without both iOS 11.4 and macOS 10.13.5. This has been a huge issue for a long time when it comes to permanently deleting messages since deleting them on an iPhone will not delete them from the Messages app in macOS. Even stranger, we discovered that Apple's own help page on the feature, which appeared as soon as iOS 11.4 was released, told users to "Update your iPhone and iPad to the latest iOS and your Mac to the latest macOS." So anyone trying to actually sync messages across iOS and macOS before May 30 wouldn't be able to according to Apple's instructions. The help page was edited a day later to remove all mentions of macOS, but was reverted back on June 1 after macOS 10.13.5's release. In order to enable Messages in iCloud on a Mac, you open Messages, then click "Messages" in the menu bar, followed by "Preferences." There, you select the "Accounts" tab, and if it's available, you'll see "Enable Messages in iCloud" under the Settings option. 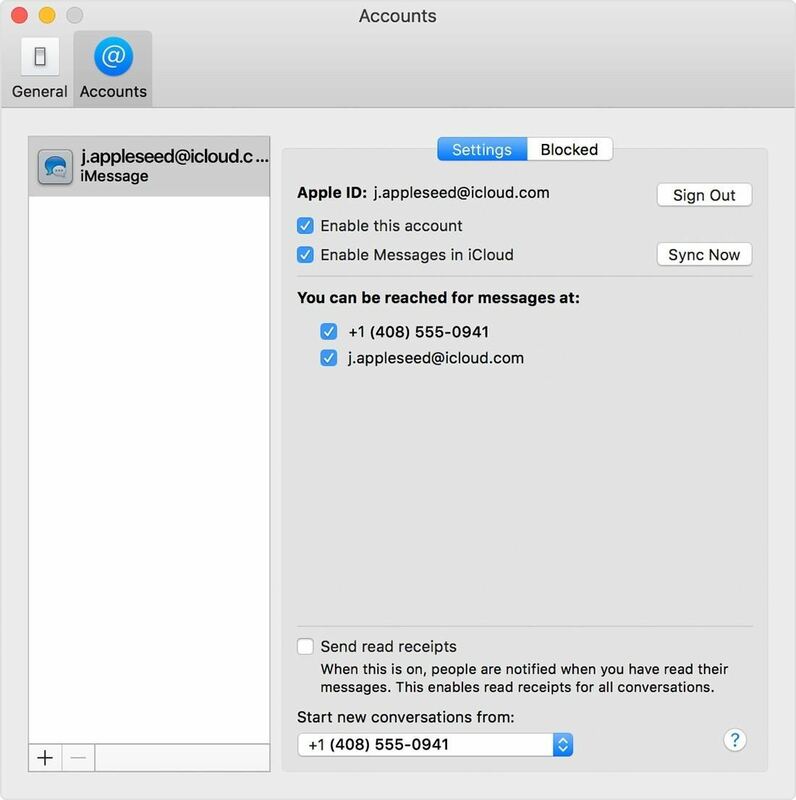 However, on macOS 10.13.4, the Messages in iCloud option wouldn't show up at all. To make matters more confusing, before macOS High Sierra 10.13.5 was finally released to everyone on June 1, starting at 1 p.m. ET on May 30, the Apple Developer site listed beta versions for both 10.13.5 and 10.13.6 instead of immediately pushing 10.13.5 from beta 5 to a final release — and it remained this way for three days. While the stable version of macOS 10.13.5 with iMessage in iCloud compatibility is out now for everyone as of 1 p.m. ET on June 1, we hope that Apple will make the process smoother the next time a big update comes out that requires iOS and macOS to work together for full functionality. Editor's note: This post was updated to reflect macOS 10.13.5's release on June 1. I have 10.13.5 beta and it is not included there. It did disappear from there for some users, but it is indeed in the stable 10.13.5 release that popped up on June 1. As for how well it works ... I'm still testing that out.